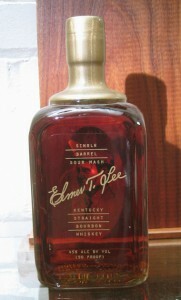 Notes: Elmer T. Lee Bourbon is produced at the scenic Buffalo Trace Distillery in Frankfort (close to Woodford Reserve Distillery if you are touring) home of numerous other whiskies such as Eagle Rare 10 year-old, Eagle Rare 17 year-old, Blanton’s, Rock Hill Farms and Hancock Reserve. (See ourAdventure Section for a tour of the distillery). This is a single barrel bourbon. Unlike most this carries no age statement. It is bottled when Mr. Lee determines the barrel is at its peak. Like Bookers (from Jim Beam), it is named after the Master Distiller, or Distiller Emeritus of the distillery it comes from. Unlike Bookers, it is priced only a few dollars more than regular straight bourbon. It is also much more approachable for a novice. Appearance: Deep red / gold in the bottle, shows its age, as well as its namesake, Mr Lee. You rarely see this color in a whiskey, as it denotes a great deal of maturity and aging. To see this color in a single malt scotch, it would have to be a to older and about four to ten times more expensive. It is a beautiful thing. On swirling, it leaves a thicker coating on the glass and has more legs and heavier body than George T. Stagg or Buffalo Trace Bourbon. First Impression: Toffee, apricots, some spiciness, and a faint trace of marzipan, leather, and on more warming: char.This is a great, full-bodied, but somehow delicate whiskey. Damn smooth stuff. Taste: Toffee, (not caramel), corn, apricot again, much like the bouquet. A medium mouth feel, more like a good armagnac than like a cognac (as I have described some other whiskies from there). Nice warming going down, without the burn you would expect for the price. Most bourbons don’t stand up to age well, they have a very turbulent ride to adolescence in new fresh charred barrels, and dramatic temperature swings (hence intense respiration in the barrel which leads to a very rapid aging compared to the sedate pace of other spirits many of which use recycled barrels). Drinks: Great in almost any drink calling for bourbon. Has the taste and body to stand up to anything you mix it with, but on the other hand it does mix well and does not overwhelm a drink. A true gentleman who knows how to get along well with others. Bottle: Gold Sealing Wax and a square bottle with rounded edges give it a nice effect. The concave medallion type impressions on the side make the bottle easy to grip when pouring – unlike a lot of square bottles. It also makes it easy to find in your bar. It looks they are trying for a slightly antique look with Mr Lee’s portrait on the back label looking through the whiskey. The clear glass and label on the front show off the color of the whiskey to good effect. The weight and heft of the bottle conveys a solid feel. A printed oval label has the legally required labeling and little more. Final Thoughts: This is where all my troubles began… This was my first single barrel bourbon after years of drinking mass produced bourbons. There is a term “Gateway Drug” meaning the one you get started on, innocently enough before. . . In a entirely different POSITIVE way this is a Gateway Bourbon. . .The difference betwwen this and the mass produced bourbons is immense. For just a few dollars more, it introduces you to the true possibilities of what bourbon can be and leaves you hungering for all the other ones out there. Beware! It is an outstanding value, and I give a personal recommendation to try.